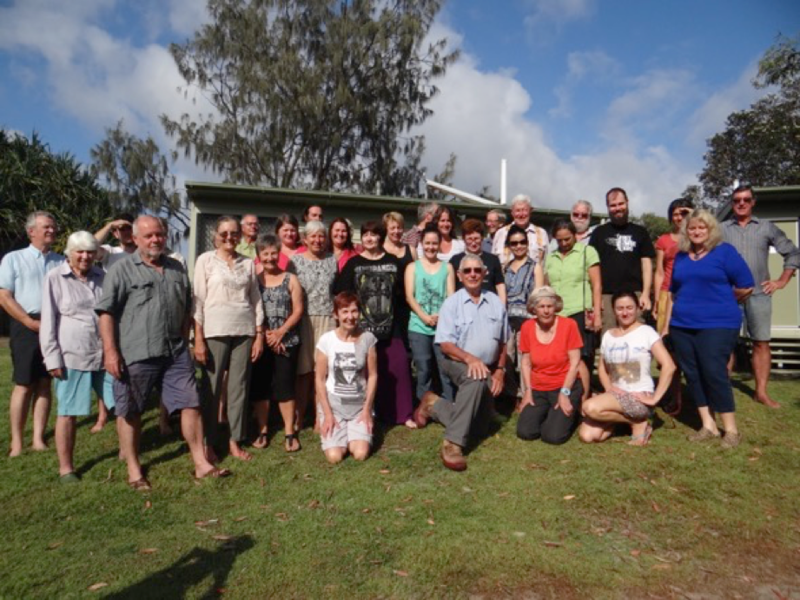 From 28 November to 4 December, 2016 a multidisciplinary team based at the University of the Sunshine Coast’s (USC) Dilli Village Research and Education Centre carried out the first of what are hoped to be regular BioBlitzs to better document the species on Fraser Island (K’Gari). The BioBlitzs are a kind of stocktake to develop an inventory of every living thing on K’Gari. They are extremely important on K’Gari because biological values are one of the three natural values for which K’Gari has been inscribed on the World Heritage list. Criteria (vii) recognizes K’Gari’s outstanding aesthetic values. Criteria (viii) recognizes the ongoing geological processes which are currently being studied over three years by a team from the University of Queensland. Criteria (ix) recognizes that the island “represents an outstanding example of significant ongoing biological processes. These processes, acting on a sand medium, include biological adaptation (such as unusual rainforest succession), and biological evolution (such as the development of rare and biogeographically significant species of plants and animals). Vegetation associations and succession represented on Fraser Island display an unusual level of complexity, with major changes in floristic and structural composition occurring over very short distances.” It is this criteria that the BioBlitz was addressing. Establishing base-line data about the biota of K’Gari is an extremely challenging task. It requires lots of human resources, more resources than the Queensland Government can provide. That is why FIDO hit on the idea of engaging citizen science and volunteers to assist the process and engaged in a collaboration with the University of the Sunshine Coast to embark on a Bioblitz to build on the Wildnet list of the various life-forms that have been reported. A start was made selecting a 50 km2 study area reaching north and west of Dilli Village. It encompassed all of K’Gari’s dune systems and sampled most of its ecosystems. It is expected to take years to complete the species list but a significant jump in the Wildnet species list was made. There were two very significant impediments to maximising the species list/s. The first impediment was restrictions on where the scientists could work created by the extremely hot dry conditions. In the interest of public safety the QPWS had closed most sections of K’Gari’s Great Walk and feeder tracks. This was justified when one of the many bolts of lightning we saw during the BioBlitz ignited a serious wildfire. Luckily the wind drove the fire away from Dilli Village to Hook Point. The event also coincided with a serious heatwave in South East Queensland. The other impediment was that the University of the Sunshine Coast was denied the requisite Research Permit A permit under Queensland’s Nature Conservation Act is required to “take, use, keep or interfere with a cultural or natural resource” within a National Park. The lack of a permit for scientific research meant that several scientists were unable to participate and those that did were seriously hampered by the lack of a permit that would have allowed the collection of specimens in accordance with the terms of the permit. It would have allowed specimens of plants with questionable identity to be sent to the herbarium for positive identification and invertebrates to be put under the microscope to clearly define them. Notwithstanding, the results of our observations were very impressive. The Bioblitzers covered a large age range from early 20s to advanced 80s with equally divergent levels of expertize from enthusiastic rank amateurs to PhDs covering a range of specialities. Not all of the Bioblitzers could be there for the whole week. Some came late and some had to head home early so that the full complement was never there at any one time. While some Bioblitzers came from far afield (Melbourne and Ballarat) there was strong local participation from the Fraser, Cooloola and Sunshine Coasts. The lack of a Permit stopped many professional biologists participating, however, it certainly didn’t stop the extensive mentoring of the citizen scientists by those that were there. In addition to the expert and amateur biologists who had assembled to document their sightings there were two other groups of people. There was a support team of technology specialists and librarians from the USC as well as people assisting with the administrative tasks. Science and arts were combined with the participation of a team of five artists from the local region who shadowed the event photographing, painting and drawing the participants and the activity. Despite the impediments the Beach to Boomanjin and Birrabeen BioBlitz pioneered a new approach to evaluating K’Gari’s natural resources using citizen science through observations only to develop a comprehensive species list of sightings from dingoes and snakes to fungi, native bees and ants, birds and plants. Teams were loosely based around those with a special interest in plants, those interested in any kind of terrestrial fauna (the Critters Team), those with a passion for birds, and those with a special interest in fungi. Due to the restricted use of walking tracks (most of which were closed due to dry weather and safety considerations) the teams couldn’t move far into the bush and were mainly confined to roads. They were also working in searing heat with daily temperatures away from the coast well into the 30s. Dilli Village the adjacent creeks and the beach. It will take time to digest and fully analyse the findings but the process is well under way and further reports will flow. All of the data has been added to the Fraser Island Repository at the University of the Sunshine Coast. One Bioblitzer was a grass specialist. She was able to visually identify 50 species of grass. This greatly expands the number of grass species previously known from K’Gari. The Fungi team is reported to have identified 74 species of fungi which means they have added many new species to the Fraser Island Wildnet List. This event, along with potential future Bioblitzs, and together with the USC’s growing Fraser Island Repository, will all help to add to our knowledge of this World Heritage site inscribed for its biological, aesthetic and geomorphological values. The blending of such a diverse group of people with such a range of expertise and experience produced an outstanding learning environment. People learnt from and about the environment and their fellow citizen scientists. Everyone was left wanting an encore as soon as it can be arranged. FIDO thanks the staff of Dilli Village and the caterers but we are most indebted to University of the Sunshine Coast for its generous strong logistical and moral support to help this first Bioblitz on Fraser Island (Kgari) turn out to be such a pleasurable learning experience in citizen science. Some of the Bioblitzers at the conclusion of the event. FIDO Projects, News, World Heritage. permalink.